Fill in the blank. Refer to the exhibit. On R1, the command to configure a static route to network 172.16.2.0 by specifying the next-hop IP address is ip route 172.16.2.0 255.255.255.0 “192.168.2.2 “. 2 What is a supernet? 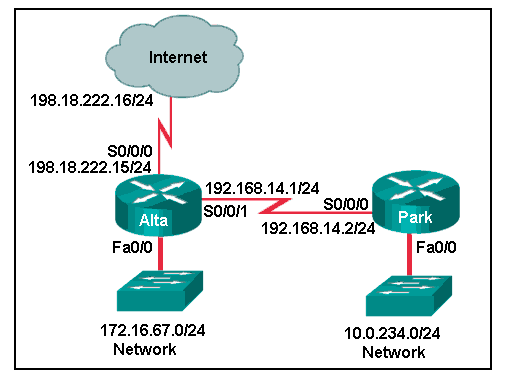 3 What type of static route is created when the next-hop IP address and exit interface are specified? 4 Fill in the blank. A “______” network is a network that is accessed by a single route. 5 Which option shows a correctly configured IPv4 default static route? Refer to the exhibit. Which set of commands will configure static routes that will allow the Park and the Alta routers to a) forward packets to each LAN and b) direct all other traffic to the Internet? They are created in interface configuration mode. They automatically become the default gateway of the router. They are automatically updated whenever an interface is reconfigured or shutdown. 8 Fill in the blank. A “floating” static route can be used to provide a backup route to a dynamically learned route. The multiple static routes all use different exit-interface or next-hop IPv6 address. The destination networks are not contiguous. The administrative distance is greater than the administrative distance of another static route or dynamic routes. 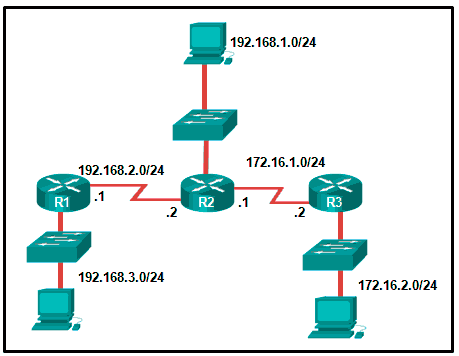 10 Which is a valid summary route for networks 192.168.8.0/22, 192.168.12.0/22, and 192.168.16.0/22? 11 [button url=”https://dl.dropboxusercontent.com/s/tkfxglib4t6eiwj/p11PKTchap6ccna2.pka?dl=1&token_hash=AAEdu4lbJt2WYZ0qhwa16M8GFJZiT14SxNP_QHHpxVIY4g” target=”self” size=”small” color=”dark”]Open the PT Activity. [/button] Perform the tasks in the activity instructions and then answer the question or complete the task. The static route to network 192.168.1.0 is misconfigured on Router2. The static route to network 192.168.2.0 is misconfigured on Router2. 12 What command, or set of commands, would be used to determine if the following configuration on router HQ works as designed? 13 A network administrator enters the following command into Router1: ip route 192.168.0.0 255.255.255.0 S0/1/0. Router1 then receives a packet that is destined for 192.168.0.22/24. After finding the recently configured static route in the routing table, what does Router1 do next to process the packet? 14 Why would a summarized static route be configured on a router? 15 Which subnet mask would be used for a network that has a maximum of 300 devices?